• FOR THE WEEK OF APRIL 8 - 14, 2019 • Dana Delany stars in "The Code," premiering Tuesday on CBS. 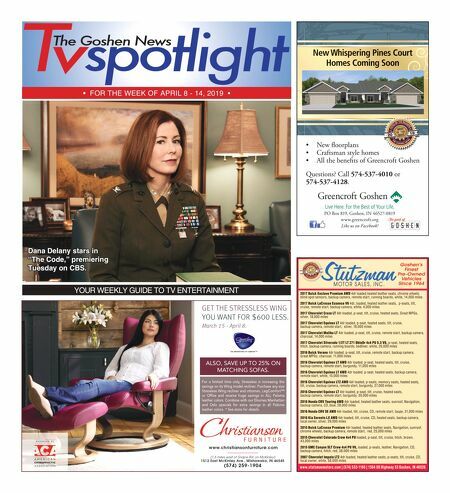 YOUR WEEKLY GUIDE TO TV ENTERTAINMENT www.christiansonfurniture.com (1.5 miles east of Grape Rd. on McKinley) 1512 East McKinley Ave., Mishawaka, IN 46545 (574) 259-1904 GET THE STRESSLESS WING YOU WANT FOR $600 LESS. March 15 - April 8. GET THE STRESSLESS WING YOU WANT FOR $600 LESS. T H E I N N OVATO R S O F CO M F O RT ™ ALSO, SAVE UP TO 25% ON MATCHING SOFAS. For a limited time only, Stressless is increasing the savings on its Wing model recliner. Purchase any size Stressless Wing recliner and ottoman, LegComfort™ or Offi ce and receive huge savings in ALL Paloma leather colors. Combine with our Ekornes Manhattan and Oslo specials for extra savings in all Paloma leather colors. * See store for details.